Transfer music from iDevice to iTunes/PC and vice versa. 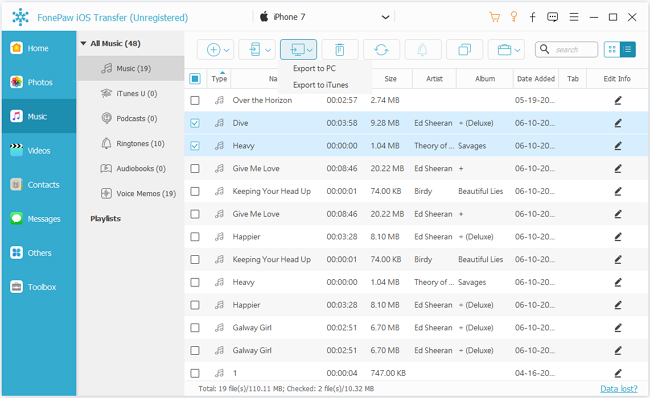 Whether the music is purchased from iTunes or imported from audio CD, you can use this program to transfer all of them to iTunes library or computer. Export contacts to various formats. You can export selected or all contacts to CSV, vCard, Outlook, Hotmail, AOL, Gmail, and Yahoo from your iOS device. Move photos between iPhone/iPad/iPod and computer. Vides shot by camera roll, panoramas, photo library, etc., are all available to export from the device to computer. And you can add any pictures back to the device with a few clicks. Copy all or selected SMS to computer. With FonePaw iOS Transfer, you can scan, preview, and export the messages you need and, if necessary, you can print them. Transfer data among iOS device. iTunes can’t directly transfer music, movies, contacts, photo library, books, and more from one iDevice to another iDevice, yet you can use FonePaw iOS Transfer to make it. Next story Direct Mail 5.4 – Create and send great looking email campaigns. Previous story iWatermark Pro 2.0.19 – Easily add watermarks to art, photos, and more.